A while ago I posted about how much I loved La Tortilla Factory's High Fiber Whole Wheat Tortillas. They are an awesome base for low calorie pizza and low calorie quesadillas, which are both dinner staples for me. At my grocery store, tons of different tortillas are all stacked together in a giant display, and I usually have to dig through all of them to find my tortillas. So, the other day, I accidentally bought the tortillas in the picture to the left (the back of the bag looks very similar to the back of the whole wheat one), thinking they were my usual whole wheat tortillas which I've bought a zillion times. But then, when I bit into one, it tasted different. I stopped eating for a second and then realized I was tasting rye. Luckily, I love the taste of rye, and since I don't usually eat normal bread or toast, I rarely have the opportunity to eat it. So, it was a good surprise! Having realized that these were not "my normal tortillas" I pulled out the bag to find out they were a new kind of tortilla from La Tortilla factory called "Soft Wraps". I actually understand why they aren't calling them tortillas since they are much thicker and more versatile than the high fiber tortillas I'm used to eating. In the calorie department, they do not disappoint. Each "wrap" is 62 grams (they are really big -- I'd approximate that they are about 8 inches across), 90 calories, 3 grams of fat, 13 grams of fiber, and 8 grams of protein (so only 1 weight watchers point). 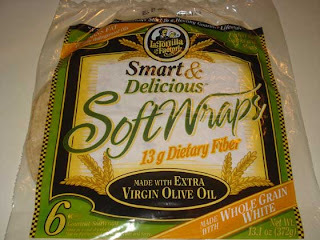 In the nutrition department they are great too -- made from oat fiber, whole grain rye flour, and extra virgin olive oil. If you like rye, these are definitely worth trying out. I found them at Safeway. I think they are probably available in most regular grocery stores. Great find! Isn't it funny how accidental purchases can work out to be amazing finds? The flavor sounds great and the nutritional stats are awesome! Thank you for uncovering another awesome product. I love those wraps! Thanks for the info! La Tortilla does make a great wrap. I've never tried using them as a pizza base. Good idea. Yes, do tell the Valentines story. My hubby last night had hurt feelings *phshaw* because he said he didn't forget, he just ran out of time and thought I would rather have him home then come home late because he was getting a card. I reminded him that if he hadn't waited until that day, that wouldn't have been an issue. May I just say how jealous I am that you've got so much tortilla variety in your super market?! We have zero variety - even in my best market. Just the typical white corn or wheat tortillas, not even whole wheat. I have to travel to get those. Boo! Love the sound of the rye ... and wish my market would carry them. I love these wraps and eat them all the time! I buy the whole grain white that you have pictured, however, once I mistakenly bought the rye one which I didn't love as much. They also make a multi-grain flavor which is good. Just be sure to check the packaging so you know which flavor/type it is (it is usually displayed on the front in the lower right hand side of the package. i love these :) the tomato basil ones are great too. If you are unable to find La Tortilla Factory brand tortillas and wraps in your local store you can call their customer service rep at 1-800-446-1516 and let them know. they are great about making sure thier product is where the demand is. Also, you may order online. I've had these. They are awesome! I was just wondering - how long to the wraps keep? If you aren't going to eat them all right away do you freeze them? Or do they keep ok in the fridge? For how long? The only way that I can think of that would make these wraps better would be less sodium. Hello, thanks so much for your information and we definitely agree that we love The La Tortilla Factory Low Carb/High Fiber Tortillas too! We also tried the garlic and herb wraps since our supermarket was out of the original ones one time and they were pretty good although we still prefer the original. :-) Can't break old habits I guess. We actually have been faithful consumers - actually most days we have at least 2 of these wraps. They are perfect for the health conscious and dieters (especially people who are following a low carbohydrate, low calorie and lower glycemic index foods – such as diabetics). We use the wraps for all of our meals – breakfast, lunch and dinner although can be also used for snacks (you just have to get creative). I would love any suggestions for how to turn these into low fat chips for nacho night.